Delight in all four heavenly Treasures with the Treasures Trove Boxed Gift Set from Meduri World Delights. 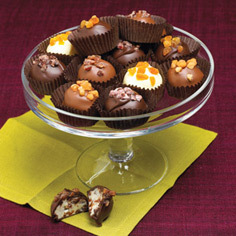 All of our favorite chocolate covered fruit is tucked inside. 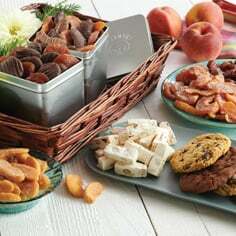 This divine gift set includes: Milk Chocolate Peach Treasures, Dark Chocolate Peach Treasures, Milk Chocolate Apricot Treasures and Dark Chocolate Apricot Treasures. 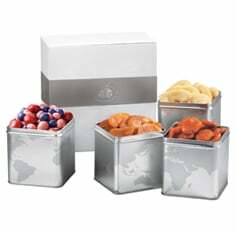 12oz selections of each of our delicious Meduri Fruit Treasures come in handsome, reusable tins, elegantly gift-boxed. 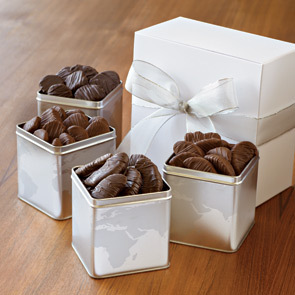 Take a moment to explore all of the delicious chocolate gift sets from Meduri World Delights today!